You know how sometimes you make something that’s so good that even after you’re done with dinner you find yourself snacking on little bites as you put it away later? That was this ham for me the first time I made it. It is tender and juicy, covered in a slightly crisp, sweet, tangy glaze that makes every mouthful tastier than the last. 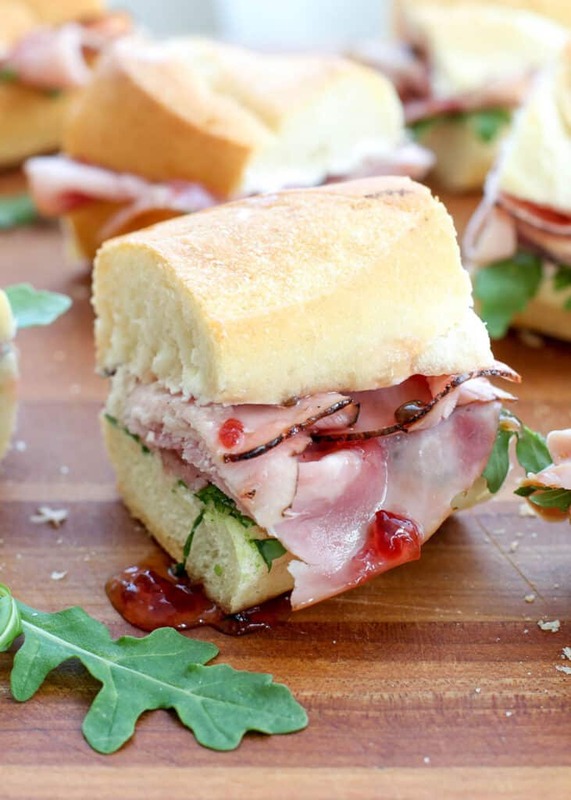 The balsamic dijon glaze is a fantastic compliment to the ham. Just a few ingredients and almost no real effort gets you an extraordinarily impressive meal that’s as suited for special occasions as it is for an everyday dinner. Because the glaze requires only three ingredients, I highly recommend using the best quality ingredients you can manage. I like to use a high quality 18 year aged balsamic glaze myself. For the dijon, choose a good variety with plenty of tang and flavor. It doesn’t need to be the most expensive dijon on the shelf but it should be tasty all on its own. You definitely do not want to substitute standard deli mustard here! You can use either light or dark brown sugar in the glaze. A darker brown sugar will yield a bit more of a molasses-heavy flavor, if that’s your jam. I do not recommend substituting with white sugar or a sugar substitute! To really get the glaze to penetrate the ham, I baste the meat several times in the cooking process. While that might make this recipe sound time consuming, I promise you it’s super easy. A generous brush of glaze every ten minutes or so toward the end of the cooking process ensures that every slice of ham is moist and flavorful. It also gives your ham that beautiful “magazine worthy” glazed appearance that makes mouths water. This balsamic dijon glaze is so ridiculously easy and delicious that I cannot imagine ever again using the package of glaze that comes with ham from the store! Once you try it, I have a feeling you’ll agree. Sean and my boys could not get enough of this ham either. I had a whole list of meals planned to use up the remaining ham and I didn’t make a single one of them! We just kept reheating and eating the ham on its own. Assuming you have more self-control than we do (it’s not hard), you could also use leftovers from his ham in lunches and dinners the rest of the week. From Stir Fry to Fried Rice to salads, this ham is delicious served up hot or cold. I love this leftover ham in fluffy Ham and Cheese Biscuits served alongside a steaming hot bowl of soup. It’s also divine in Cheesy Potato, Egg and Ham Breakfast Casserole. This ham is also fantastic in the Best Ham Sandwich of Your Life! Served as a main dish or on toothpicks as a party food, absolutely everyone loves these easy meatballs. 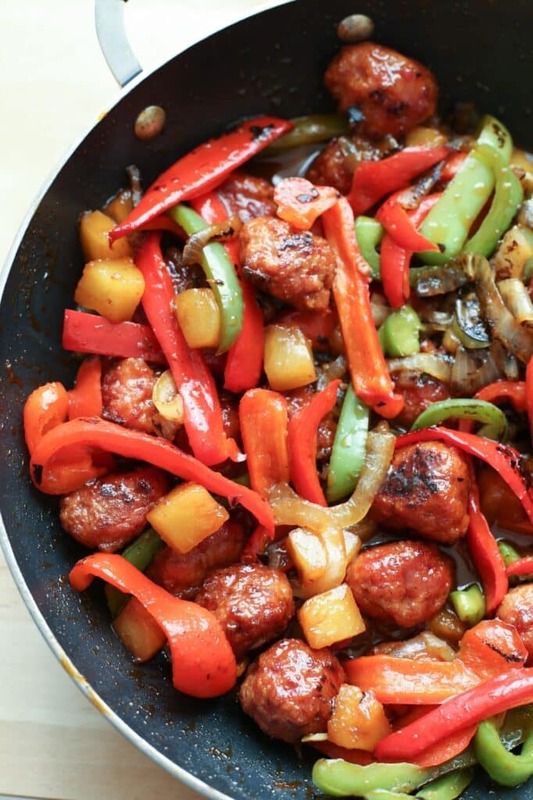 I also love ham balls in a simple Sweet and Sour Ham Ball Stir-Fry . It’s so popular in my house, in fact, that I often keep a half batch of Ham Balls in the freezer just to make this recipe. 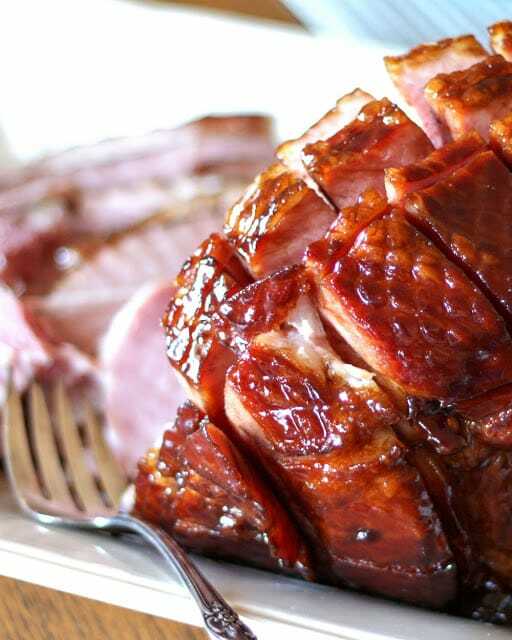 If you do find yourself with leftovers after making this glazed ham recipe, I urge you to give Ham Balls a try. You won’t be sorry! 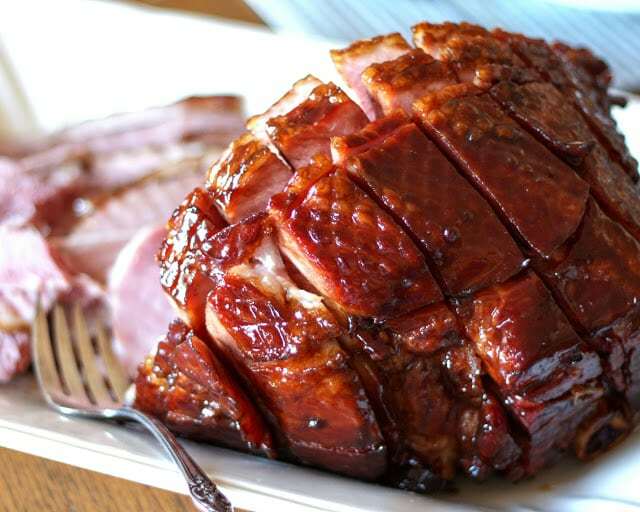 I’ve been making Balsamic Glazed Ham for every possible occasion for the past five years. I like to serve the ham with Vanilla Bean Sweet Potatoes or Garlic Smashed Potatoes, Slow-Cooker Creamed Corn and Skillet Green Beans. 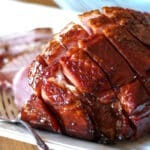 You can make this recipe again and again and not get sick of it but if you love Balsamic Glazed Ham as much as me, I have a good feeling you’ll also fall head-over-heels for some of my other ham favorites. When you can’t get enough of that addictive savory and sweet combo, this Ham and Pineapple recipe with its brown sugar and balsamic glaze should be next on your list. Served on skewers, it’s a spectacular appetizer. 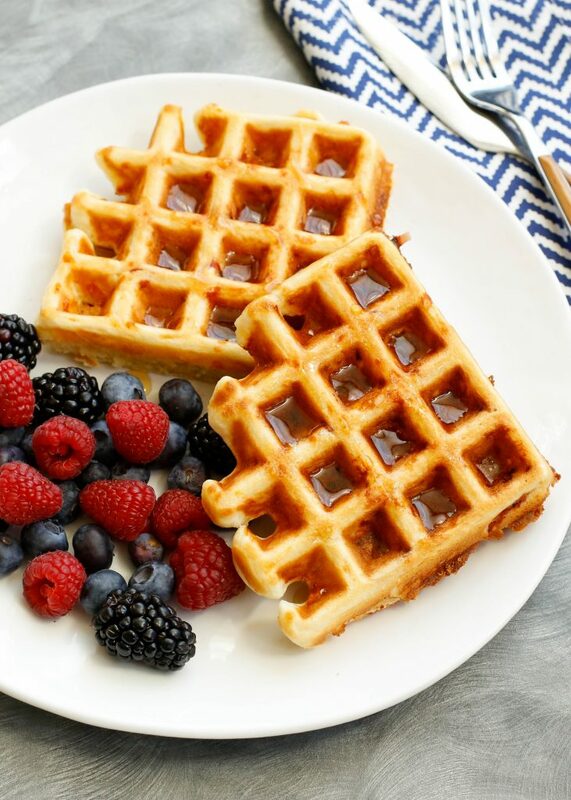 Ham and Cheese Waffles are a fun and new way to enjoy ham for breakfast or brunch. They’re absolutely perfect for a big weekend morning meal or as an easy breakfast any day of the week. If you’re after a hot, comforting, stick-to-your-ribs meal that can cook all day in the crockpot, Slow Cooker Potato Ham Chowder is the way to go. Serve it with some crusty bread and you have an easy meal perfect for a cold day. Back to Balsamic Dijon Glazed Ham! This recipe is savory, sweet, tangy, tender, juicy and everything else you could want in a ham dish. I hope you love it as much as my family and I do! Remove the ham from the refrigerator 1-2 hours before it needs to go into the oven. This will allow the meat to come a bit closer to room temperature before it goes into the oven. Place the ham on a large cutting board and score the ham with cuts, 1/2″ deep in a diamond pattern. If that sounds confusing, look down at the ham and start in a straight line from one end to the other making a 1/2″ deep cut all the way across and over the top of the ham. Then repeat this cut, about an inch apart, slicing the ham from one side to the other. Then turn the ham 180 degrees and repeat, straight cuts, all the way across the ham. It should resemble a checkerboard when you are finished. This process allows the glaze to penetrate deeper into the ham. It is well-worth the effort and it only takes a few minutes. Preheat the oven to 325 degrees. Line a large roasting pan or a heavy rimmed baking sheet with foil and place the ham cut side down in the pan. Roast 45-50 minutes. 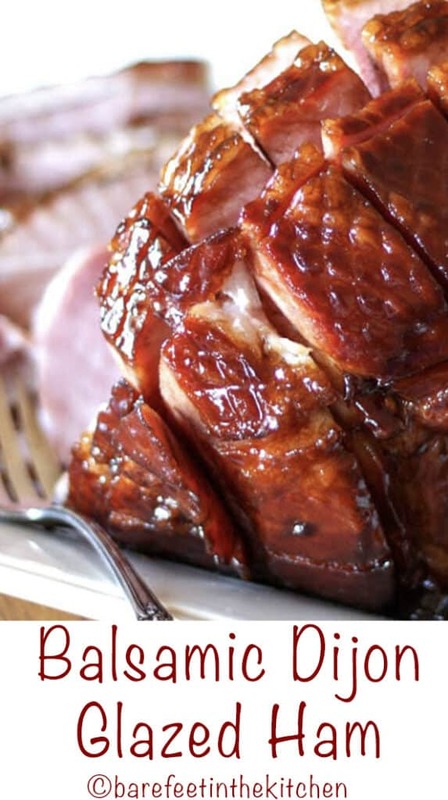 While the ham begins roasting, combine the sugar, vinegar and mustard in a small cup or bowl. Set aside next to the stove. Remove the ham from the oven and baste generously with the glaze, using about 1/4 of the glaze. Continue to roast the ham until it is deep brown and glazed, brushing the ham with more glaze every 10 minutes or so. I roast an 8 lb ham for 50 minutes, then baste it, 10 minutes more, baste again, 10 minutes more, baste it generously with all remaining glaze one last time and finished roasting it for 5 more minutes. An average of 10 minutes cooking time per lb of ham should be just right. Transfer the ham to a large platter and let rest 10-15 minutes prior to slicing. Place the ham on a large cutting board and score the ham with cuts, 1/2" deep in a diamond pattern. If that sounds confusing, look down at the ham and start in a straight line from one end to the other making a 1/2" deep cut all the way across and over the top of the ham. Then repeat this cut, about an inch apart, slicing the ham from one side to the other. Then turn the ham 180 degrees and repeat, straight cuts, all the way across the ham. It should resemble a checkerboard when you are finished. This process allows the glaze to penetrate deeper into the ham. It is well-worth the effort and it only takes a few minutes. Transfer the ham to a large platter and let rest 10-15 minutes prior to slicing. Enjoy! Sounds like a very good ham, I'll have to try it! Hi, I was just curious - this is served warm, right? This Christmas is the first time I'll be attempting a ham and I don't know much about them. The internet consensus seems to be that they're served cold/room temp. Thanks for the recipe! I prefer a warm ham myself, however it can be served warm, room temperature, or cold. Enjoy! You can cook it cut side up, if you'd like. I typically cook it cut side down so it is steady on the pan as I move it in and out of the oven. I've never made this in anything other than a conventional oven. I don't think the outside will caramelize the same way in a roaster oven. You don't need to remove the outer layer of the ham. Just bake it as it is sold at the grocery store. Enjoy! I used This glaze for my Easter ham. It was super good. I will Make this over and over. The glaze not only tasted great but the ham looked gorgeous.. The glaze gets slightly sticky in a very good way! Loved it!